Friday Essay – Do You Have a Dream to Follow? Here’s another question from lifehack.org – Do you have a dream to follow? I must admit this question made me laugh a bit. Sometime ago I either heard someone say or read somewhere that you shouldn’t follow your dreams, especially the ones where you show up naked to take an exam for which you never studied. This is good advice and I’ve stuck by it. I also recall hearing or reading that a dream isn’t always enough, you need a plan to follow. And, dreams are all well and good but if they are absolutely impossible you will always be disappointed when you fail to achieve them. I’ve been told to reach for the stars, if you don’t quite make it at least you’ll have reached the moon – or something like that. So, my response to the question is yes and no. I have a dream, maybe a few dreams, about what I’d like my future to be. But I’m not banking on them all to come true exactly as I hope. I also have some plans – I ought to create some more details for them – that I expect will lead to new and deeply fulfilling work. Hopefully, these plans will lead to a different lifestyle. Maybe the plans will fall apart completely. I don’t expect them to fall apart entirely but I don’t expect smooth sailing the whole way, either. This is what makes life and purpose-finding so interesting – it’s an adventure! And, failure isn’t the worst thing that could happen. I have a quote, attributed to J.K. Rowling, in my office: It is impossible to live without failing at something, unless you live so cautiously that you might as well not have lived at all – in which case, you fail by default. I think living by this philosophy is almost more important than having a dream. Also, I’ve never been that person who had one driving passionate dream to follow. I have a few interests. I’m relatively competent at most things I’ve set for myself. I enjoy plenty of activities. But, I was never the kid who decided to be a national news anchor at 12 and worked and went to the best journalism school and worked crappy jobs here and there all with the goal of reading the ten o’clock news from Toronto. I didn’t decide to become a famous novelist at 12 and do nothing but write until I finally had my first novel published at 25, then became a New York Times bestselling author at 30. After high school I travelled a bit, worked a bit, parented a child, learned stuff at university, wrote some stuff, took jobs that seemed like stuff I wanted to do … And, here I am a middle aged woman wrestling with meaning-making and purpose-finding. It seems like a typical trajectory. But, I have failed and I have dreamed. I intend to continue to dream and to continue to fail because I don’t want to live so cautiously that I might as well not have lived at all. Do you have one dream? Do you have several dreams? Can you follow them? Will you follow them? Will you not live so cautiously? This entry was posted in Blog Post, Friday Essay and tagged dreams, failure, J.K. Rowling, meaning making. Bookmark the permalink. Interesting you didn’t use the word goals, that is how I think of these things. Pursuits and goals, ends and means. But that doesn’t mean they automatically give meaning. at least for me. I have to work hard to find what is meaningful. And meaning seems to be fleeting stuff anyways. Sorry I am rambling on your comment board but your post is very thought provoking. 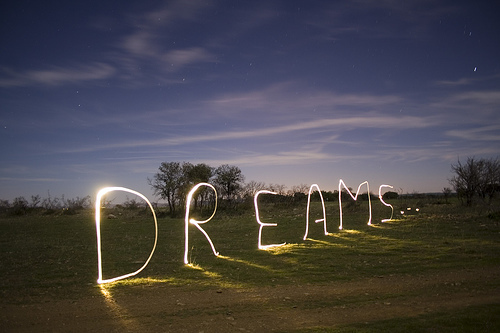 My dreams? I have pages of them, the biggest is win the Nobel Peace Prize for something biological. So yes, I am a big dreamer, probably a big failure too.